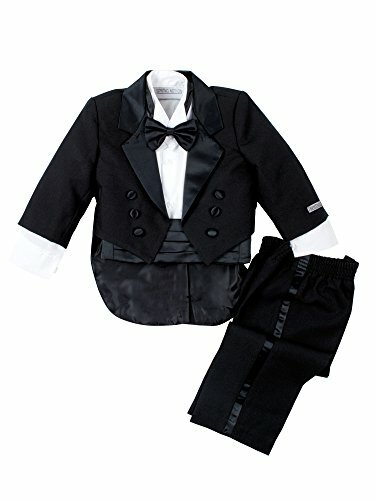 This traditional boys tuxedo suit is perfect for Weddings, Church, Baptism, and any Special Occasions. Timeless design. It's a complete set consists of tuxedo, shirt, bow tie, cummerbund and pants. Tuxedo: Black single breasted jacket with smooth satin lapel; center vent tail; fully Lined. Shirt: White pleated front; long sleeve shirt (65% Polyester 35% cotton ). Adjustable Around the Neck Satin Bow Tie. Satin Cummerbund with elastic back. **This product is exclusively sold by Spring Notion. If you have any questions about this product by Spring Notion, contact us by completing and submitting the form below. If you are looking for a specif part number, please include it with your message.